CHICAGO, IL - NOVEMBER 4: Anthony Davis #23 of the New Orleans Pelicans and Lauri Markkanen #24 of the Chicago Bulls box each other out on November 4, 2017 at the United Center in Chicago, Illinois. 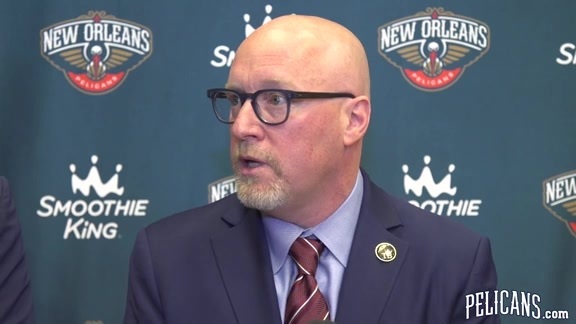 NEW ORLEANS – The New Orleans Pelicans today announced the team’s five-game 2018 preseason schedule. The Pelicans will open preseason play with four road contests against Chicago, Atlanta, New York and Miami, and will conclude preseason play with a home matchup against the Toronto Raptors at the Smoothie King Center on Thursday, October 11. All five Pelicans preseason games will be broadcast live on the team’s flagship radio station, WRNO 99.5 FM. Tickets for the preseason home game at the Smoothie King Center will go on sale at a later date. For more information about Pelicans tickets or to become a member of Squad 6, visit pelicans.com/tickets or call (504) 525-HOOP.